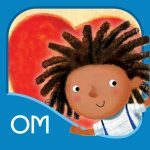 I Love You Too – Ziggy Marley is an interactive ebook that encourages reading readiness and teaches vocabulary and word recognition. This feel-good ebook was created for early learner’s ages 3-8, but users of all ages and abilities will love it. Sing and play with Ziggy Marley and his calming Jamaican accent as you explore pictures, learn new vocabulary and personalize the story with your own narration.